Symbol - F Atomic number -9 Period Number :2 Valency -1 Atomic mass-19 Group Number : 17 Dennis' Method:Fluorine does not occur free in nature. It occurs in the combined form. Dennis' Method: This was devised by Dennis, Veeder and Rochow in 1931. Fluorine does not occur free in nature. It occurs in the combined form. Dennis' Method: This was devised by Dennis, Veeder and Rochow in 1931.
sodium fluoride. Thisremovesthe hydrogen fluoride vapourscomingwithfluorine. 1. Action with Hydrogen: Hydrogen explodes violently in fluorine even in the dark. 2. 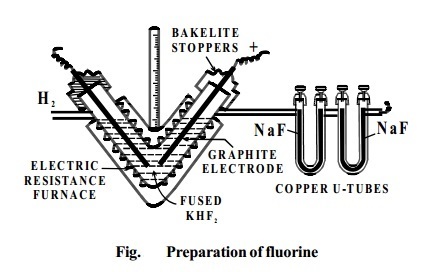 Action with non-metals: Non-metals like carbon, silicon and phosphorus burn in fluorine forming fluorides. 4. Formation of Interhalogen compounds: It forms a variety of inter halogen compounds with other halogens. 3. NaF is used as a preservative to prevent fermentation and also for preventing dental cavities.